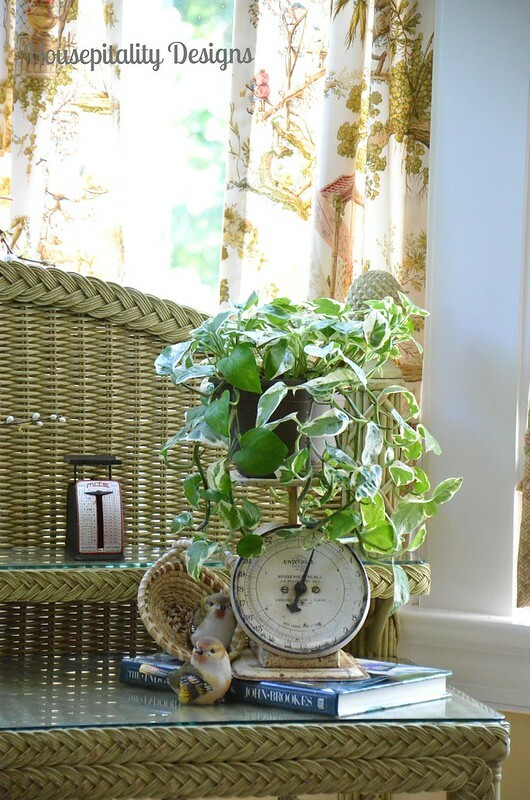 I revealed my Sunroom Makeover last month when I was guest posting. . . .
~ ~ for Susan over at Between Naps on the Porch . . So I thought I would give it a second reveal here . .
~ ~ with the addition of a lamp that I received from Lamps.com. The great folks at Lamps.com sent me this beautiful lamp by Quoizel. 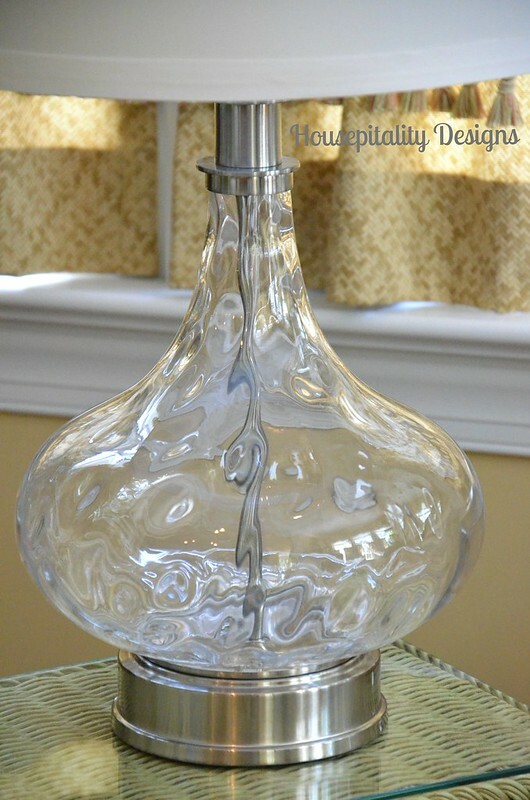 The description of this lamp states…. ~ ~ “fluidly in motion with the ripples of the flowing glass”. . . 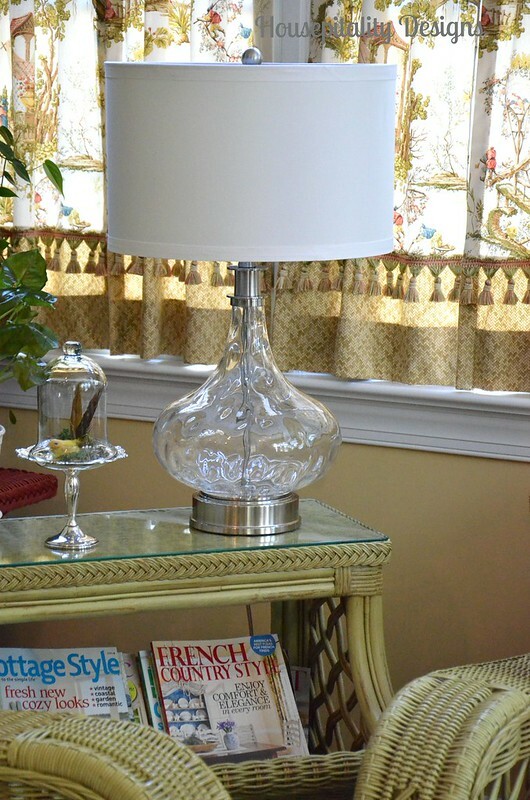 I knew that this lamp would go wonderfully in the newly “refreshed” sunroom. The cushions were recovered in this large buffalo check fabric by my friend Linda . .
~ ~ I wanted a lighter look for Spring and Summer. Linda also made new pillows using the same fabric of the slipcovered ottomans. I love the way the checked fabric lends to a lighter and fresher feel to the room. 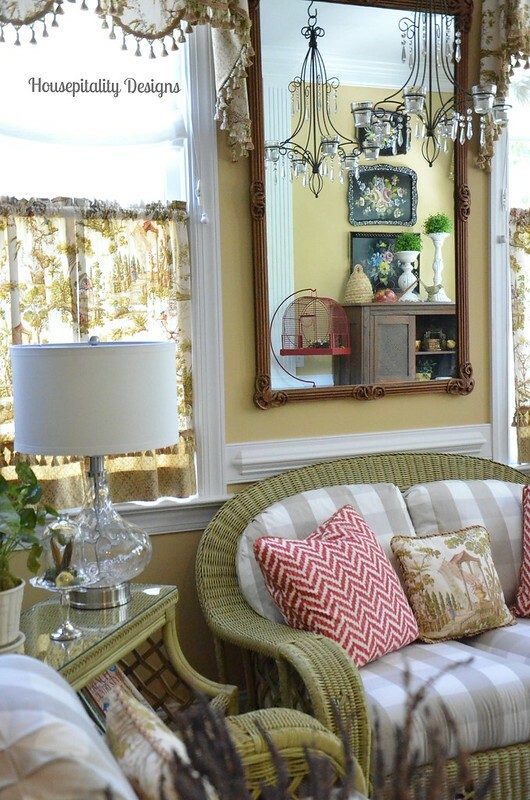 I changed some vignettes in the room . .
And some things remained the same . .
Love the way the sunroom looks now . . with its new facelift. And a big thanks to Lamps.com for sending me this fabulous lamp . 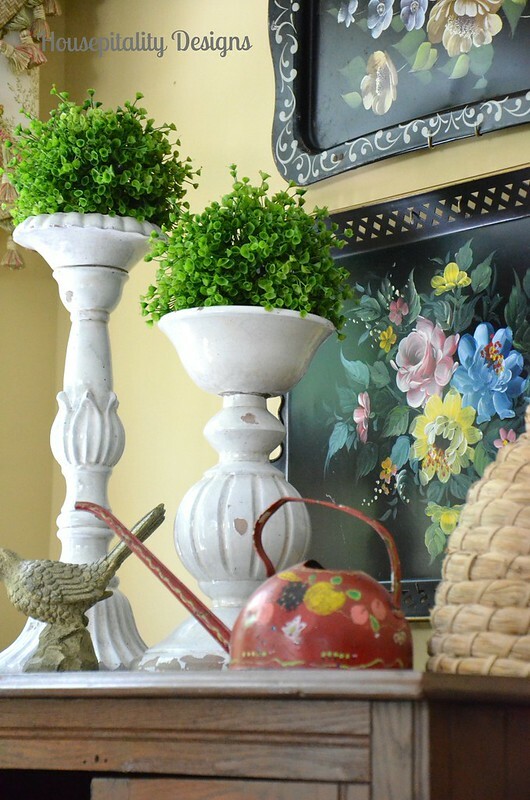 . .
~ ~ that has certainly contributed to the makeover of my sunroom in a most beautiful way. Wishing you all a most wonderful day!! Note: This lamp was provided by Lamps.com and all opinions are entirely my own. Looking good and nice lamp. What a lovely room. I would spend a lot of time in there. What a great room to relax in. I could just sit in that room all day! The lamp is great. 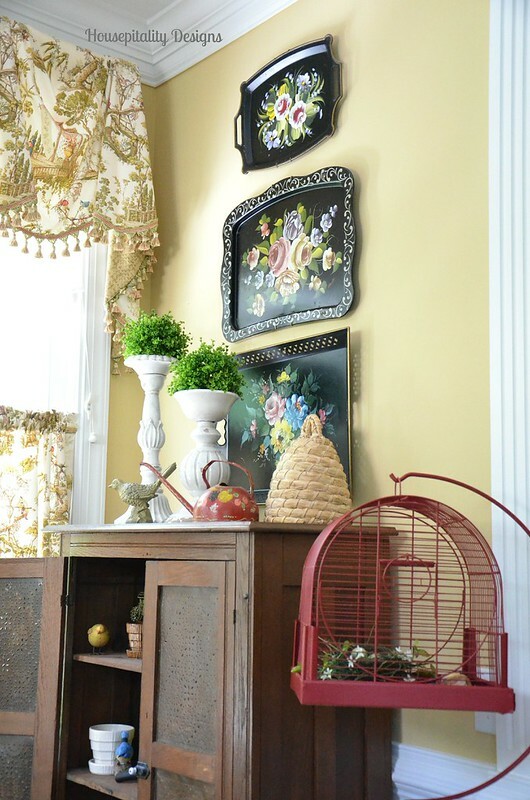 Penny @ the comforts of home’s recent post…Welcome June! Have a great week Shirley! Shirley, this is one of my favorite rooms in your beautiful home. It’s so inviting! I love your new lamp and definitely agree that it appears as though it is in motion! It’s s wonderful addition to this room! So pretty, Shirley. 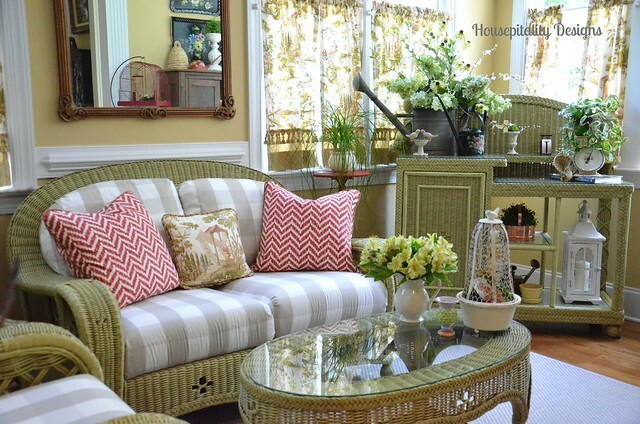 I love a sunroom, and yours is so pretty as you’ve freshened it! BEAUTIFUL Shirley!! What a pretty lamp! Oh Shirley the room is just gorgeous and that lamp is so pretty. I just want to curl up in there with a good book and relax. Beautiful. I’ve always loved your sunroom, Shirley! It’s so pretty and cheery, the perfect spot to relax. The lovely lamp looks great in there. Gee’s recent post…A Table is a Table…. The lamp is perfect in that area! It looks great with the other lighting, the mirror, the crystal….gorgeous! Love the new lamp, Shirley! 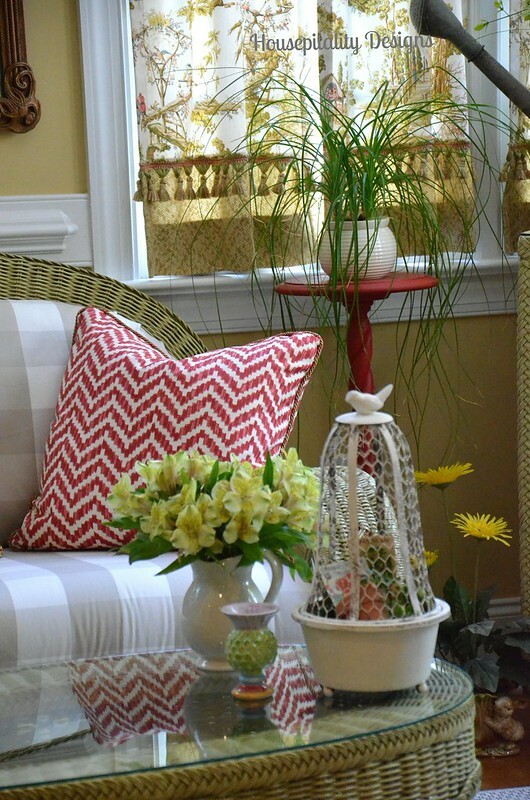 It looks great in your beautiful sunroom! I love seeing pics of that gorgeous space…I could spend hours there! Your sunroom is always a beauty. Love the check cushions and that lamp is very cool. I could spend a lot of time in this room for sure. I think this is one of my favorite rooms in your house, Shirley! : ) Everything looks great. Love your vignettes. Love the new lamp. I think that because it is clear glass that keeps it from taking up a lot of room visually and makes it nicer to enjoy the rest of the pretty aspects of the room. Nana Diana’s recent post…LOOK WHO TURNS TWO TODAY- OUR LITTLE CJK! You know how I feel about your lovely home. It seems to be that there isn’t a space there that isn’t lovely and warm and welcoming. I always enjoy coming to see what you’ve done. You never let me down.. it’s always beautiful. Another wonderful job Shirley! Oh Shirley…everything is lovely. My favorites have always been your tole trays. We had a sunroom in our previous house…and I miss it. I will just have to visit yours “virtually.” Blogs are so much fun for all of the “virtual” visits we get to make. Your sunroom is absolutely beautiful. I especially love your new cushions. I’m sure you spend a lot of time in this room. I would! Thanks for sharing. It’s a beautiful lamp, Shirley. Perfect for your sunroom. 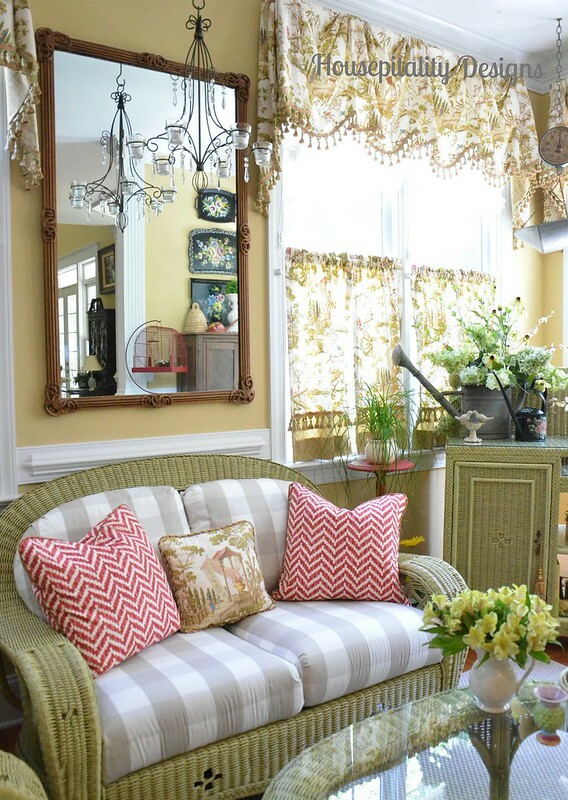 Your sunroom always looks so sunny and cheerful. I like the changes you made. That lamp is a nice addition to the room. 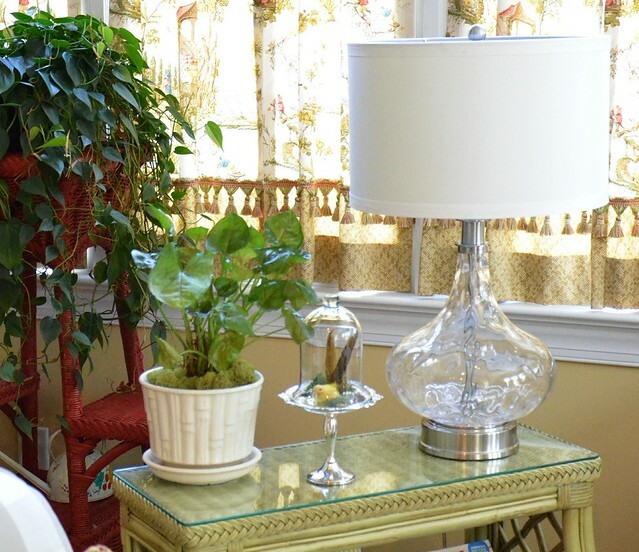 Your new lamp is beautiful and goes so well in your sunroom. Everything looks so comfortable and fresh – a very nice good for Spring and summer. Thanks so much for sharing. Have a great week, Shirley. 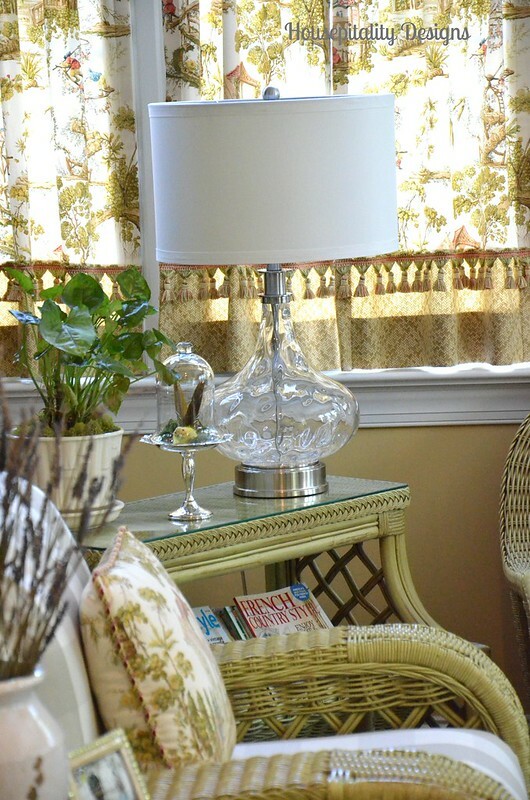 I LOVE the new lamp, it is perfect in your gorgeous sunroom! 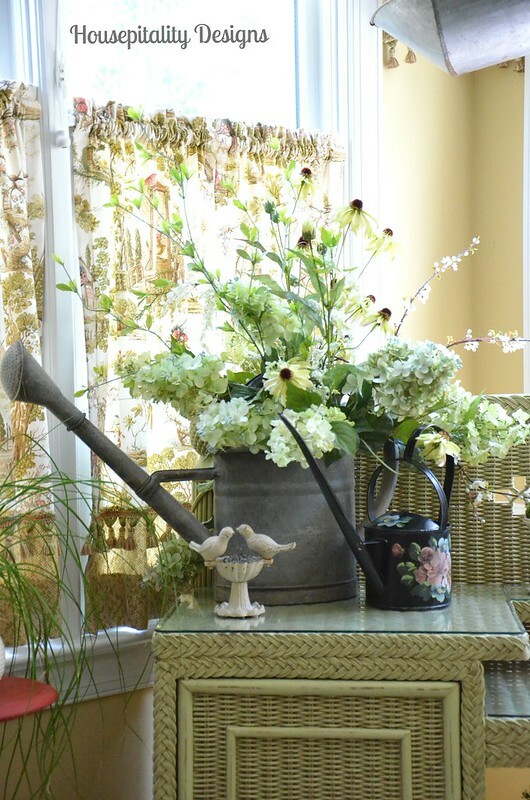 I also love the arrangement in the watering can. I bought a watering can this year and am trying to AGE it outside:) Then I will do an arrangement in mine too:) Today, Joe and I went to Longwood Gardens and took 150 picturesa:):) BUT, I have been trying for hours to do a post and my pics won’t load!!!!!!!!! SOOOOOO frustrating!!!! 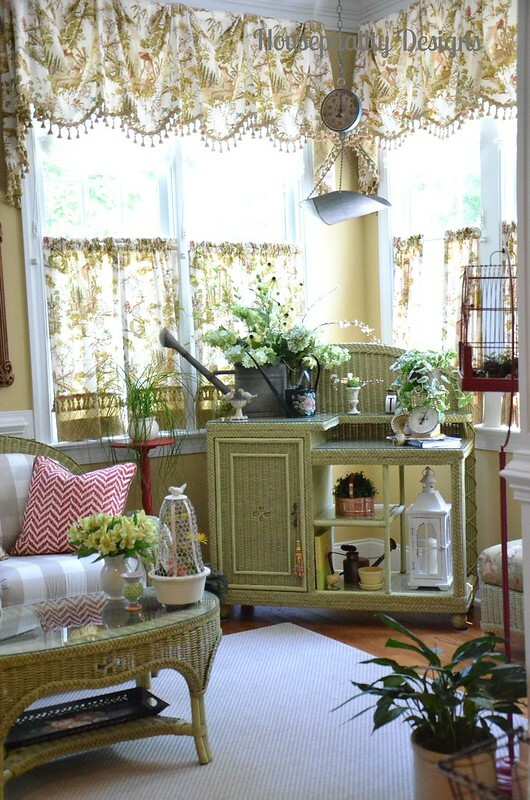 You truly have the most beautiful sunroom I have ever seen Shirley. It looks like a garden delight. A place I would sit and never want to leave:) The lamp is pretty too, perfect addition. Everything is PERFECT Shirley! I love the lamp and everything else. You must be really enjoying that room. So pretty! And really colorful, but in a Summer kind of way! I get so much inspiration from you! I had several candle chandeliers like the one you have in front of the mirror, and I foolishly sold them when I retired and sold the business. I should have kept at least one, but I sold ALL of them…in ALL the colors!!! What a dummy I am sometimes! I love the lamp! I’ve become enamoured with different lamp and lampshade styles in recent months. That one’s a beaut! The base looks almost like water! 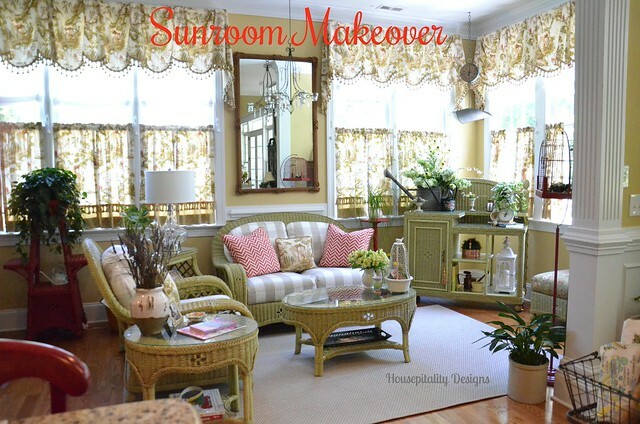 I’ve always adored your sunroom Shirley! Beautiful new lamp! Mary’s recent post…Mystery Ingredient Club: Chipotle Shrimp & Chipotle Bloody Mary! Your sun room is so pretty. I cannot get enough of the pretty feel to that room. Love the lamp too. That is simply gorgeous. I think having a sun room would be so much fun, especially if it looked as good as yours. My friends have a sun room and it always feels good to be in. I might have to look into adding one on to my home. Thanks for sharing.